Preheat the grill to high. Place the flaked almonds on a baking tray and toast under the grill for 2 to 3 minutes. Tip out onto a plate and set aside. Warm the vegetable oil in a large frying pan set over a medium heat. Season the ray wings with salt and pepper, then add to the pan and cook for 6 to 8 minutes on each side, until cooked through. Fill a medium saucepan with salted water and bring to the boil. Add the broccoli florets and cook for 5 to 6 minutes. Place the sun-dried tomatoes, basil, garlic and some salt and pepper in a food processor. Blitz for 2 minutes, then add the lemon juice and oil and blend again. Transfer to a bowl. 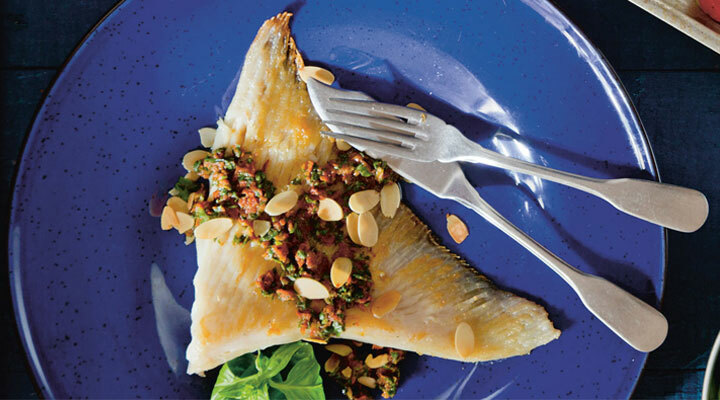 To serve, place the ray wings on a plate, spoon over some of the sun-dried tomato pesto and scatter over the toasted almonds. Serve the broccoli florets on the side.